So it’s interesting that I’ve been handed Compulsion Games’ long-awaited survival, RPG, action, stealth, adventure, everything title We Happy Few. First announced way back in 2015, the Gearbox-published game is finally ready for release. 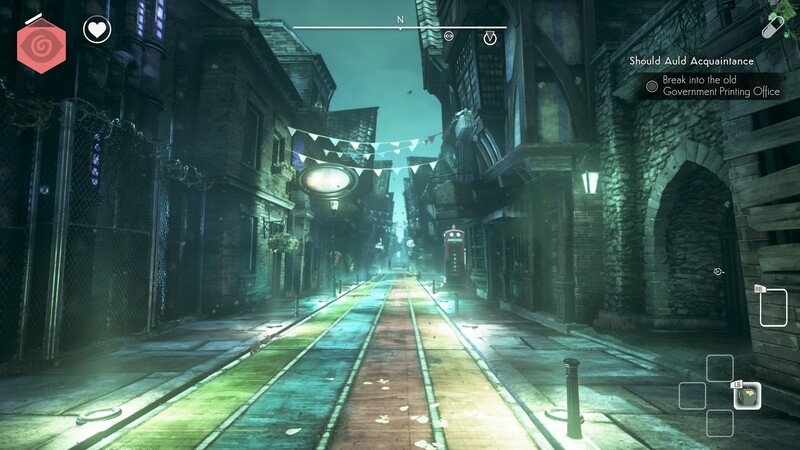 We Happy Few dishes up an alternative take on ’60s Britain, where the media is tightly governed, the aristocracy hold all of the country’s worth, and the people wander around in a haze, attacking anyone who doesn’t conform to their idea of traditional values. What a fantasy world… right? It’s 1964 and the country is feeling pretty damn good, courtesy of a government-decreed drug named “Joy”. The civilians of Britain take Joy in order to maintain a vulgar, overly-positive outlook. Negativity is frowned upon and those who fail to use the drug – or “Downers” as they are branded – seem to take mysteriously lengthy vacations. Huh. Players must work to help Arthur escape his butterfly and rainbow-filled nightmare. Arthur’s travels will take him through a variety of districts, some “lawful” and patrolled by a totalitarian police force – “The Bobbies” – while others, such as the countryside Garden District, are populated by dangerous, plague-ridden Downers. Any way you slice it, the inhabitants of Wellington Wells are all hostile in their own ways, and must be handled with fragility if Arthur is to escape paradise. As We Happy Few progresses, more and more mechanics are made apparent. As such, the game quickly develops an identity crisis. Originally conceived as a survival title, Compulsion decided to pad out the narrative elements when feedback showed that this aspect was what players were actually excited for. Unfortunately, as a result, the game has become lost in itself. We Happy Few is a linear action adventure that also features a large open-world and incessant crafting elements, which slow the game’s great storyline to a crawl. Arthur must be kept fed, watered, and well-rested. Eating bad food can lead to sickness, which needs curing. Falling afoul in a fight can lead to bleeding which, if bandaged with a non-antiseptic bandage, can then lead to infection. That is barely scratching the surface. Weapons break with ease. Tools need power cells. A nighttime curfew must be obeyed. Each area requires its own specific set of clothing. Flowers are to be gathered to create medicine. Some quests are time-sensitive. Running, jumping, and climbing depletes stamina. 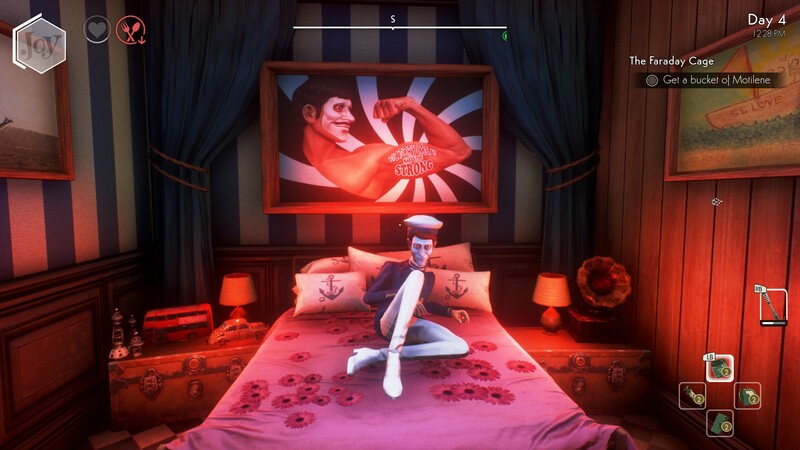 Everything in We Happy Few is measured to the nth degree which, rather than providing depth, just makes the game a finicky, mechanical slog, severely distracting from its dramatic, world-building narrative. Difficulty sliders can fine-tune these elements, but they still feel like unnecessary annoyances. Even for those who bought a ticket to ride on such a survival game, We Happy Few‘s gameplay is also problematic. Missions generally boil down to either fetch or stealth quests. Let nobody tell you otherwise; We Happy Few is a stealth game more than it is anything else. Hours are spent crouch-walking through bushes, alleyways, and darkened buildings. Stealth is your only real option, as the combat is clunky, hindered by a clumsy weapon-switching system. Thus, confrontation is always best avoided altogether. With enemies leaping on you for a myriad of reasons at the drop of a hat, you better get good at hiding. Basic necessities (such as a quick save/load feature) are missing and there is a laundry list of small but irritating design flaws. For example: if you spend, say, 10 minutes uncovering a section of the map, but are then killed before a save, then all the uncovered map will be re-hidden again when you respawn. Alternately, you might die and find yourself respawned bang in the middle of the town square, but whilst the curfew is in effect. I had to reload after an interaction prompt failed to appear. I once bled out during a cinematic. These foibles prod away at you frequently, making it hard not to quit upon death. AI is, unfortunately, a bust. NPCs struggle with pathfinding, fighting, and even some idle animations. I’ve arrived into villages of NPCs standing stock still, or stuck in the floor – and I don’t think I can blame the Joy for that one. There is a serious disconnect between the amazing design of the world and the awkward character models that inhabit it. Because what a world it is. Wellington Wells is beautifully crafted, featuring the cool, suave elegance of ’60s interiors, blended with flower-filled pastures of the countryside and, if you take a wrong turn, a grim underbelly of flies, corpses, and decay. In a absolutely brilliant touch, colourful streets and skies physically change in real-time as the Joy (which you can pop to aid your subterfuge) leaves your system. This immersive scenes of Orwellian government buildings and isolated, post-war towns is soundtracked by an amazing score, which captures the spirit of the era whilst subtly changing to reflect each new area, or Arthur’s current predicament. No one can fault the world and narrative created here, which features a dry wit and recognisable elements recalling Monty Python, A Clockwork Orange, The Prisoner, Doctor Who, and other British icons. We Happy Few looks and sounds great, managing to create a sublime outdoor prison that is at once the happiest and most terrifying island in gaming. There is some longevity offered for the $60 price tag. 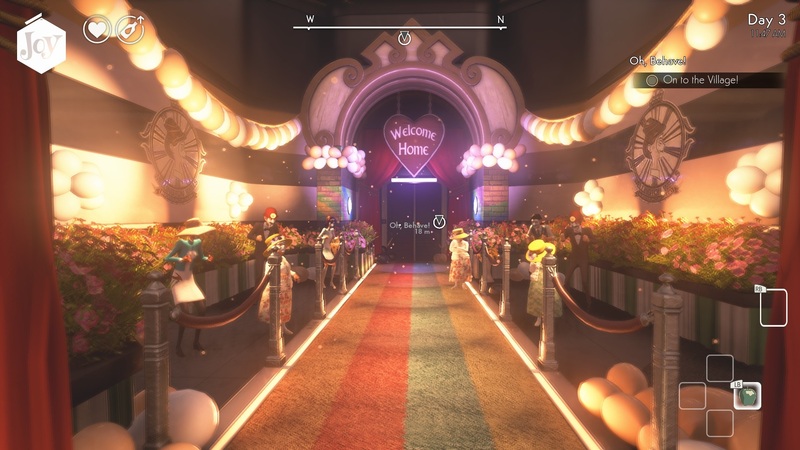 We Happy Few is relatively expansive and populated with sidequests and collectibles. Not to mention that, although Arthur’s journey may reach its ultimate conclusion, there are other citizens with a story to tell. Of course, this is provided that the player feels the inclination to revisit borko Blighty at all. We Happy Few is not a bad game per se, but it simply has too many notable issues to be considered a success. Compulsion has attempted to make the game much more than it ever needed to be, and in fiercely clutching to the original emphasis on crafting, survival, and status management, they’ve over-complicated matters, smothering We Happy Few‘s best asset. There is a complaint, often lobbied against BioShock: Infinite by its detractors, that the gameplay elements of that particular release “got in the way” of a great world and story. That argument applies here, only you can also add weak combat, repetitive missions and irritating bugs to the problem. Perhaps, in time, some of these issues will be addressed. We Happy Few is unique. It features gorgeous environments, great music, twisted humor, and a magnetic story. It deserves praise for those aesthetics. But the game is what matters, and it is sadly lackluster in that regard, with bad combat, mundane stealth, and endless, frivolous mechanics. By choosing the fastidious “micro-management” path, We Happy Few distracts far too much from its true potential as a dystopian gaming classic. And that’s the biggest downer of all. An exercise in apathy, neither solid nor liquid. Not exactly bad, but not very good either. Just a bit “meh,” really.